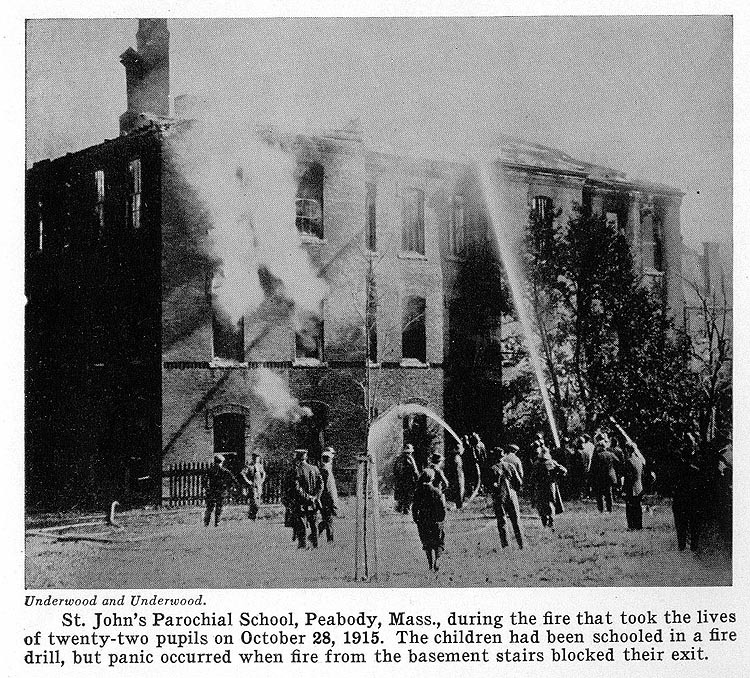 On October 28, 1915, at 9 a.m., a fire was discovered in the basement of the St. John’s Parochial School at Peabody, Massachusetts. This building was 95 feet long, located about 350 feet from the street and was partly hidden by other buildings. It was erected in 1892, was three stories and basement in height, with brick walls and wooden interior, plastered walls and ceilings, partitions sheathed and varnished. There was a corridor about eleven feet wide on each floor extending thewhole length of the building. On the three upper floors there were openings off each corridor into six schoolrooms. There were two stairways opposite each other, descending to the center of the first floor corridor. These stairs, five feet wide, were the only means of exit from the upper floors. Under these stairs were entrances to the basement. The stairways on the first floor were about thirty feet apart. Between them was a sheathed partition with double doors which were kept open when the school was in session. The school had seventeen nuns in charge of 672 pupils, of whom 300 were on the first floor, 260 on the second and 112 on the third floor. The smaller children were on the first floor. On the morning of the fire the high school commenced at 8:30 o’clock and the grammar and. primary grades at 8:45. The fireman who had care of the heater in the basement had been there to look after the furnace, but was absent at the time the fire started. Some of the nuns had been in the basement a half hour before the fire was discovered and at that time there were not any signs of fire. The doors to the basement were left open, as was the custom. Five to ten minutes before the fire was discovered, the Sister Superior passed by one of the basement doors on her way to the upper floors without noticing anything unusual. When she reached the third floor, she saw a light smoke. Suspecting fire, she immediately went downstairs to investigate, and saw flames coming up over the stairs at each end of the basement. Opening a classroom door, she requested a nun to see that all exits were open, and went to the second floor to ring the bell which was the signal for a fire drill, and remained until the last child had left the upper floors. After the bell sounded for every one to get in line and leave the building, the fire increased very rapidly. Thick smoke and flames at the ends of the corridor near the basement doors caused fright, much confusion and a congestion at the front vestibule. It was customary in the fire drills of the school for some of the girls and the boys to go down the back stairs out of the rear door, and the balance of the girls to go down the front stairs and out of the front door. In accordance with their training the line was well kept and the children under control until the first floor was reached. The wind, blowing about nine miles an hour, was from the rear part of the building. As both doors from the basement and the outer doors at ench end of the first floor corridor were open, flames, heat and smoke were driven towards the front of the building. Whether some girl accidentally fell in the front vestibule or was overcome by the heat and smoke from the basement concentrated at this point is unknown. After one child fell, others fell, until nineteen children were held in this spot by smoke and flames. When others in the corridor near the vestibule entrance saw this they turned back, and escaped either by the rear exit or jumped through windows. In the meantime, some of the nuns had reached the front entrance, and, aided by the janitor and other men who had reached the scene, rescued a number of the children who had fallen in the vestibule. This work continued until rescuers were driven away by the intense heat from the basement. This all happened before the fire department arrived at the scene of the fire. Two of the girls rescued died afterwards at the hospital. A telephone alarm was sent in by a fireman who happened to be off duty. He then assisted many of the children to escape through windows. The cause of this fire is unknown. The corridor that extended through the basement had a sheathed partition on each side extending only part way to the ceiling. In this corridor there were two or three wooden barrels in which to keep the sweepings from the schoolrooms. The contents of these barrels were removed once a week. Under the rear stairs was a closet or bin some five feet wide and ten feet long. The fire evidently started in the closet or in the rubbish barrels, as indicated by the burning at these particular points. Once the fire gained headway, with both exits from the basement to the outer air open, it spread very rapidly. The building was a large and roomy structure, having exits thought to be ample for the number of children housed. Many times at fire drills it had been vacated in a mintue and a half. The children were well disciplined, but they had only been trained to leave the building by the way of the two usual exits. Unfortunately this line of march led directly into the corridor where the smoke and fire were pouring up from the basement. While the exits provided were all the law required, these were not adequate to provide proper safety. 1. "Parochial School, Peabody, Mass., Oct. 28, 1915", 1000 School Fires, A record of 1000 school fires and major school disasters, October, 1939, Boston, Mass., page 17-21.